At this point in time, we are not able to ship outside of the U.S., but that may be changing soon – we’re working on it. Hi, I’m 30 in a few months, have acne scarring from years of bad acne (age13-25) and am looking for something that’s a good anti aging as well as may help with some of my scarring. I’ve had these scars for so long I’m not even sure cream will help now but it’s worth a try. I don’t get the kind of large acne all over my cheeks anymore but I’ll occasionally get a couple around my period. I have oily skin but in the winter it dries out very easily. I use Juice Beauty and Mario Badescu products, tea tree oil astringent and Burt’s bees moisturizer right now. For makeup I’ve used nothing but Bare Minerals for the past 6 or 7. I was trying to decide between the Green Tea and Citrus but was hoping if i gave you a good skin background you could point me in the right direction 🙂 Thanks! My short answer to your question is to recommend you purchase a couple of samples (or perhaps one of each – Citrus, Green Tea, Lavendar and Floral). However, I have forwarded your question to Sheryl Seraj by email – she will be able to give you a more thorough answer to your question. 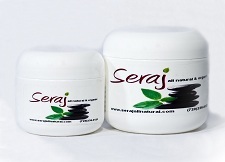 Seraj products are amazing. I was out of green tea moisturizer for 3 weeks, and I went back to the drugstore product I have used in the past. My skin feels dehydrated, and I have broken out terribly. I am 41-years-old and do NOT have sensitive skin; however I have discovered the difference between using an okay product and one that really works. Does this product contain polyphenone? I used the Citrus cream a few years ago on my baby and me and I loved it. I would like to try the green tea one. Could you please tell me it’s safe for a one year old baby?